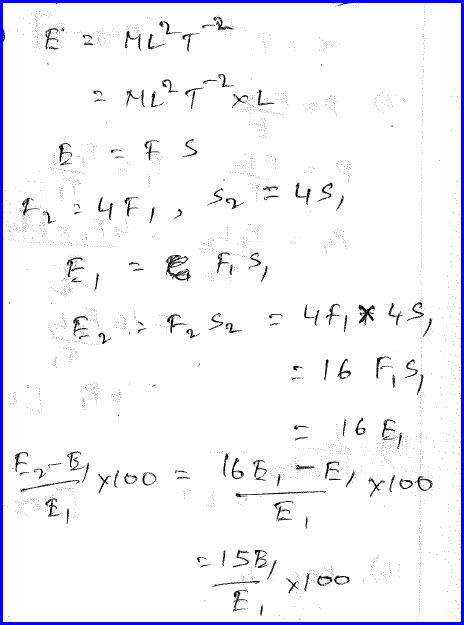 We would like to solve the first problem regarding the units of energy. Energy is mathematically defined as the product of force and displacement. If the units of length and force are changed how does the units of energy changes is the question. By writing the dimensional formula for the energy, we can find how energy changes can be determined as shown in the diagram below. Energy can be defined as the product of force and displacement. Here in the problem as the unit of length and force are multiplied by four times, the energy units will be increased by 16 times as shown in the diagram below. Displacement is similar to length itself. 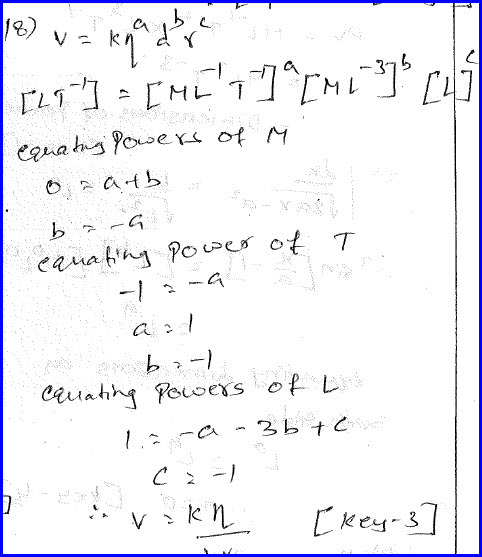 The second problem is regarding force relation with other physical quantities. 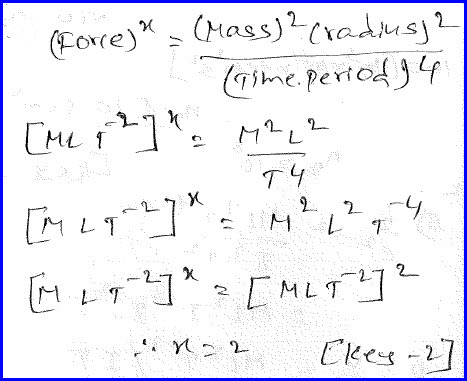 It is given that force depends on mass, radius and time period as shown in the diagram below. We know that force is defined as the rate of change of momentum. It has the units of momentum per time. Time period is nothing but certain time. By using dimensional analysis, we can solve the problem as shown in the diagram below. Thus we can measure the value of the unknown power of force. The next problem is regarding critical velocity. It is the constant velocity acquired by a body when the resultant force acting on it is zero. 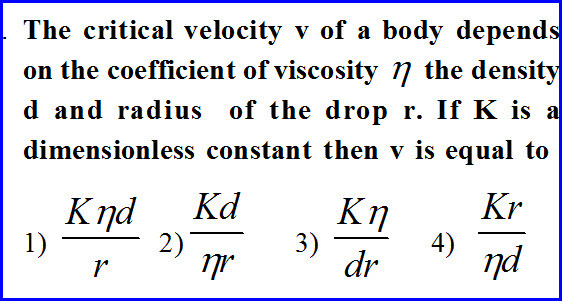 It depends on the coefficient of viscosity, density and radius. Coefficient of viscosity is the measure of the viscous nature of the medium. We know that viscous force depends on the area of cross section, velocity of fluid flow and is inversely proportional to the distance between the layers. By writing the dimensions on both the sides of the equation, we can find the value for the critical velocity as shown in the diagram below. 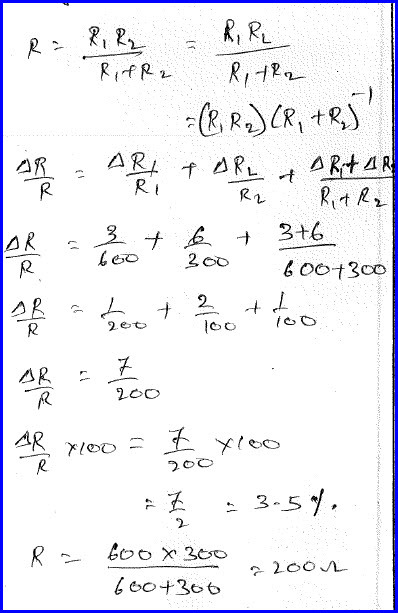 The following problem is about measuring the error in identifying the error when we measure of two resistors when they are connected in parallel. We need to find the effective value of the resistance as well as the error in the measurement. We know the formula to find the effective resistance when two resistors are connected in parallel. Each part of the resistance has its own error thus we need to find the effective error in the total value as shown in the diagram below.